When Dr. Cynthia Cupit Swenson first arrived in Okurase, Ghana, in 2006, the village’s 3,500 people drank water directly from a nearby river. Toilets were practically nonexistent. Children often went hungry, and people died from small sicknesses. Yet, as the MUSC psychologist recalls, village residents possessed a thriving, joyful attitude. “They had very little in the way of material things, but everything in the way of culture and spirit,” says Swenson. 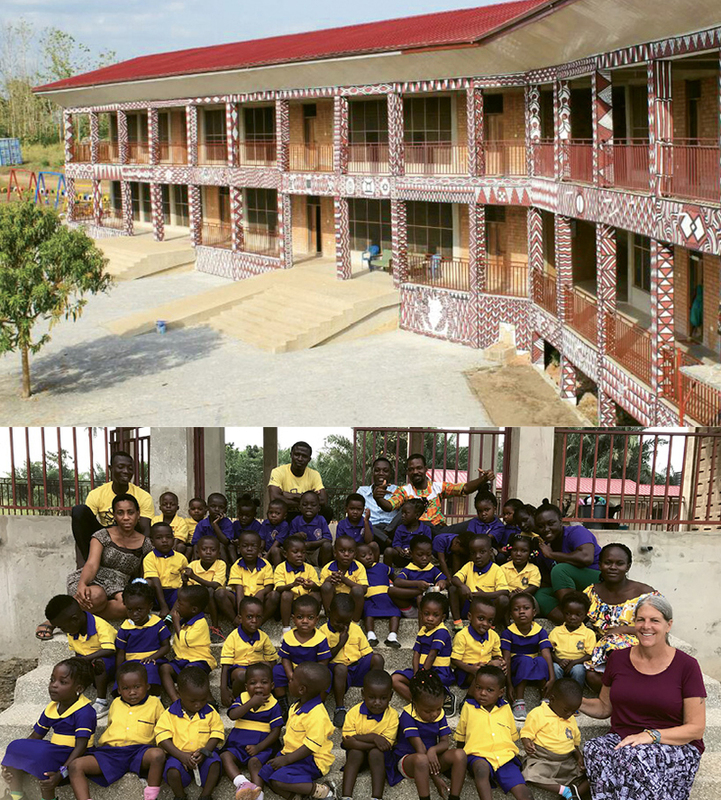 Since then, Project OKURASE has developed piece-by-piece with the same blend of intention and altruism that led Swenson to Ghana in the first place. After she connected with drum maker Dr. Samuel “Powerful” Yeboah to buy African drums for children in the Union Heights neighborhood of North Charleston, he encouraged her to bring the kids to Okurase, a place known for its drum carving. That cross-cultural exchange blossomed into a partnership that has turned the village into a model for implementing sustainable, healthy living. Walk around Okurase today and you’ll see the 18,000-square-foot Nkabom (meaning “unity”) Centre Vocational School building, designed by students from the Clemson Architecture Center in Charleston. Project OKURASE and Mount Pleasant’s Sundrops Montessori operate a sister school on the ground floor, and adults there will soon learn career-building skills like auto mechanics and entrepreneurship. Electricity wasn’t available for construction, so the Project employed and taught locals in making compressed earth bricks. Nearby is an organic garden, planted in partnership with the MUSC Urban Farm. When Swenson brought a child losing his sight to the United States for medical treatment, the boy’s Ghanaian caregiver volunteered at MUSC’s farm and took new skills back to Okurase. Near the school is a new Biogas Toilet System, which is connected to a biodigester that produces gas used for cooking. There’s also a well that taps into an aquifer for safe drinking water. Each project was prioritized and accomplished together with the village’s leaders. “You avoid dependence when you are a true equal partner,” says Swenson, emphasizing that nearly all of the Project’s paid employees are Ghanaian. The Nkabom Centre Vocational School building houses the Nkabom Sundrops Montessori School Program (and more). This month, volunteers will visit Okurase for the 10th Village Health Outreach, a five-day blitz of medical care that draws 1,500-plus people from all over the region for free disease testing, medical and mental health treatment, wound care, and pharmacy services. Each program is rooted in research, including a nutrition and malnourishment study that led to the garden’s creation. Likewise, Okurase residents are taught about research ethics and the importance of informed consent before they participate in studies, like one that students from Norway will conduct to learn about women and depression. That certainly applies to the Nkabom World Music and Culture Festival. Started last year in partnership with Charleston-based Rhythm Moves, it attracts more than 3,000 participants and 200 musicians, dancers (including a traveling, professional company formed by the Project), and acrobats for a massive celebration on the first weekend in August.